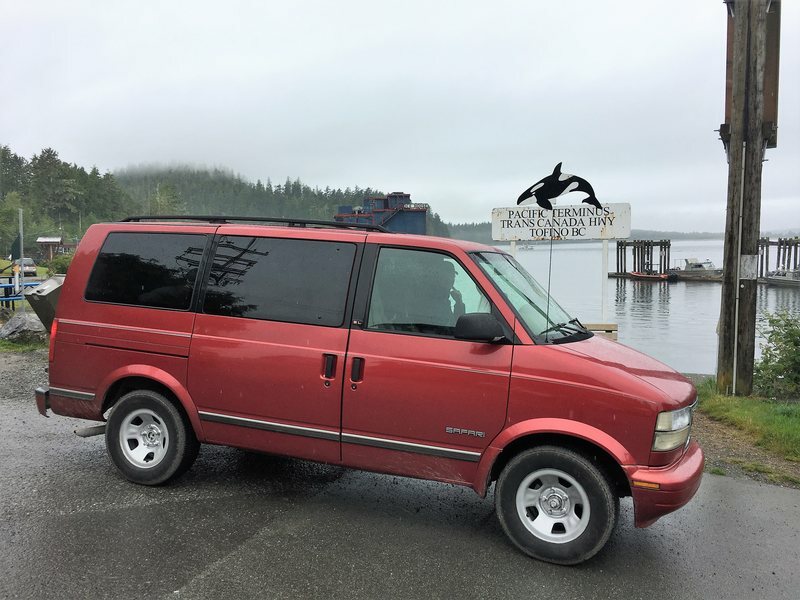 Vancouver Island was the first place in Canada we explored after buying our GMC Safari van. We had spent an entire week in Vancouver decking out our little house on wheels and were craving the outdoors and to be away from the city. 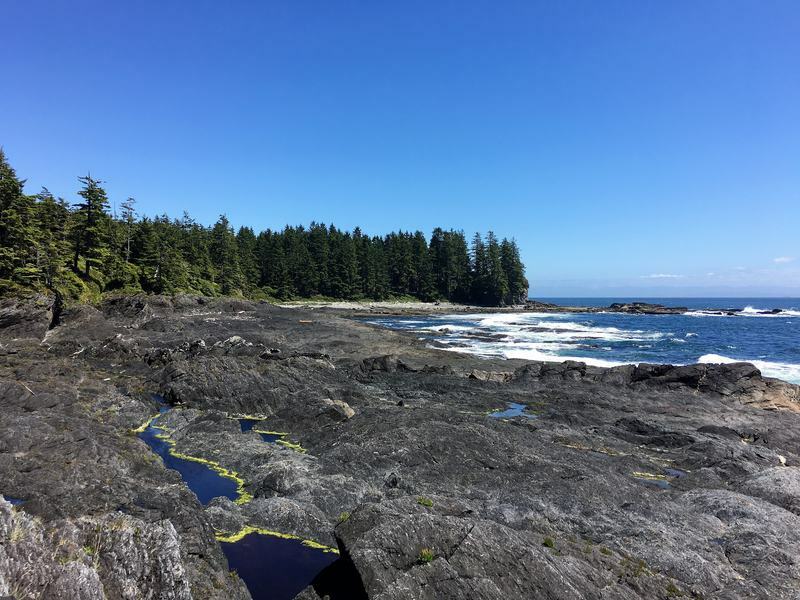 Enter Vancouver Island: an island about 500 km long and 100 km wide and the perfect introduction to Canada. 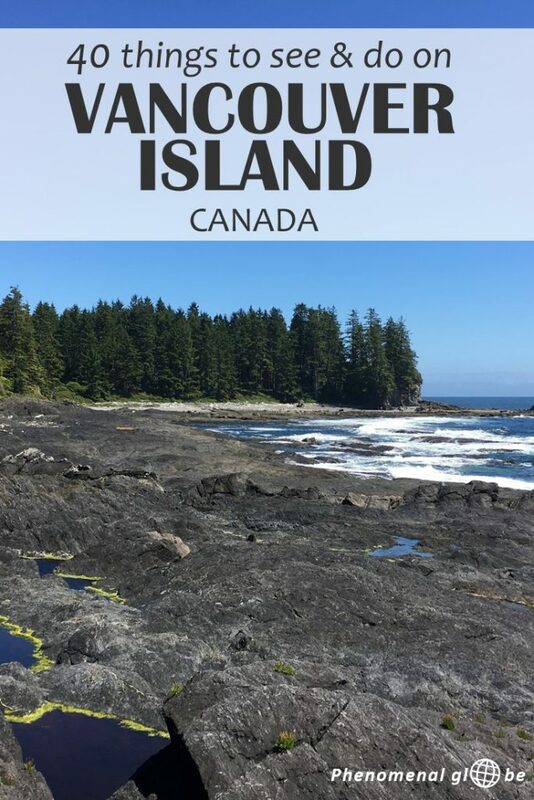 This ‘little’ island has it all: forest, mountains, beaches, little villages, amazing wildlife (both on land as well as in the water) and Victoria, the lovely capital of British Columbia. 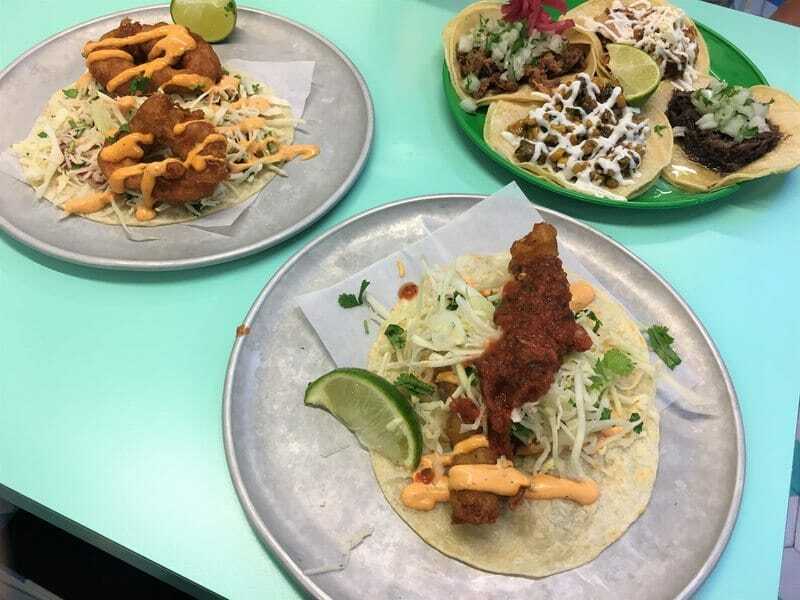 Where to eat on Vancouver Island? 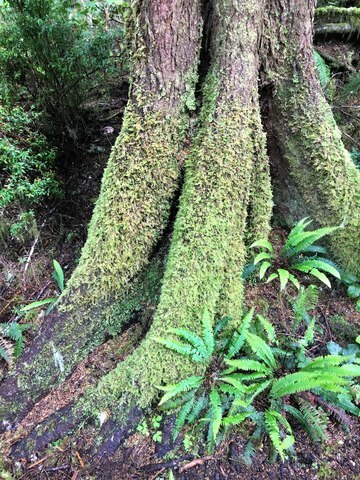 Where to find (free) campsites on Vancouver Island? 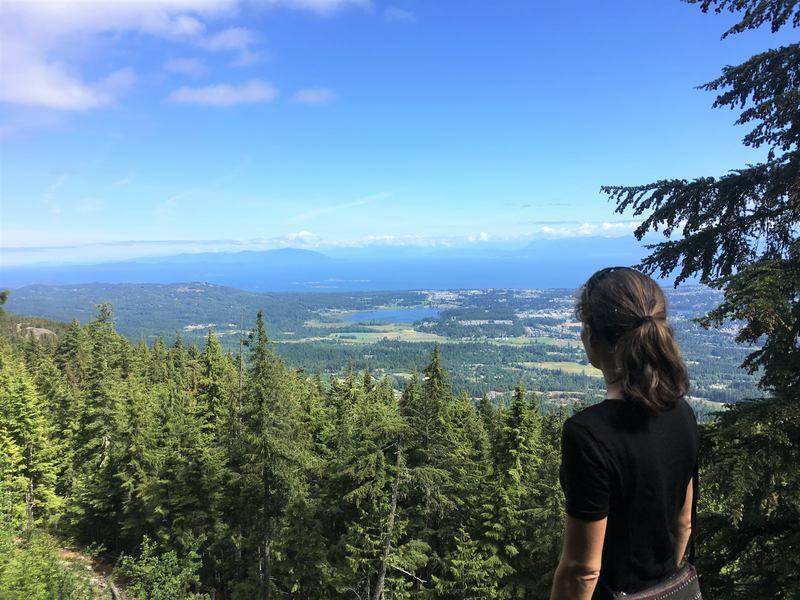 How to get to Vancouver Island? 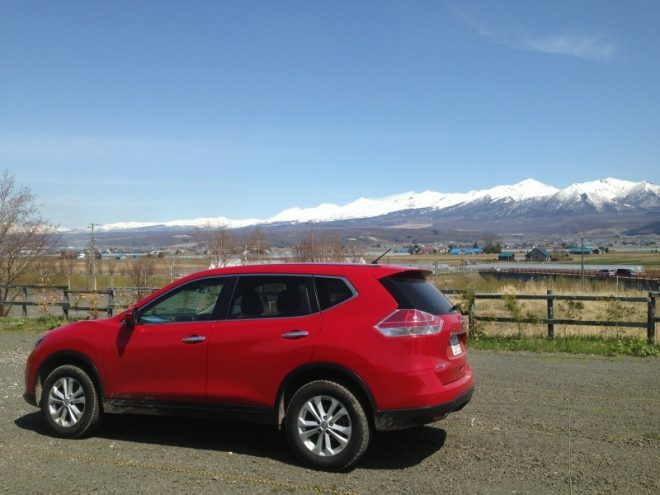 How to get around on Vancouver Island? The British Columbia Parliament building is beautiful and impressive. 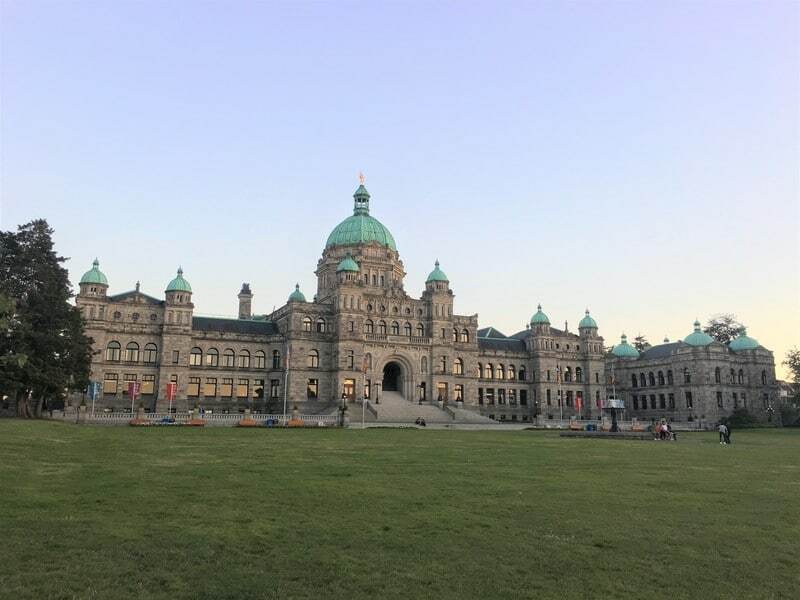 And the story about how this building came to be is a good one… Back in the 1890’s the British Columbia held an architectural competition, whoever won would be the architect to design their legislative building. There was one requirement though: the architect needed to be Canadian. But… Francis Rattenbury, a young and aspiring architect who had just emigrated from the U.K., entered the competition under a false name and won! To be fair, he designed a beautiful building that’s still in use. I learned all this on a free tour around the Parliament Buildings, this may have been the funniest tour I’ve ever taken… The tour was led by a young actor playing the role of Francis Rattenbury, complete with a British accent and a costume. He led us around the building while sharing his life story and telling us more about the construction process. Anyway, not only did I laugh throughout the entire tour, I also learned a lot about the building. Altogether a highly recommend activity! 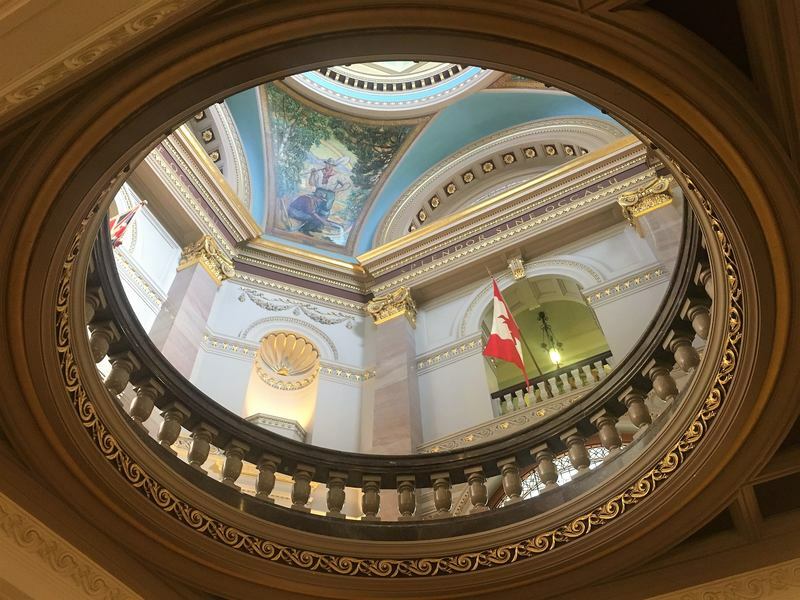 You can find more information about the free tours in the British Columbia Parliament Buildings here. The Fairmont Empress opened her doors in 1908 and is a city icon. Fun fact: this building was also designed by the ‘presenting to be Canadian architect’ Francis Rattenbury! 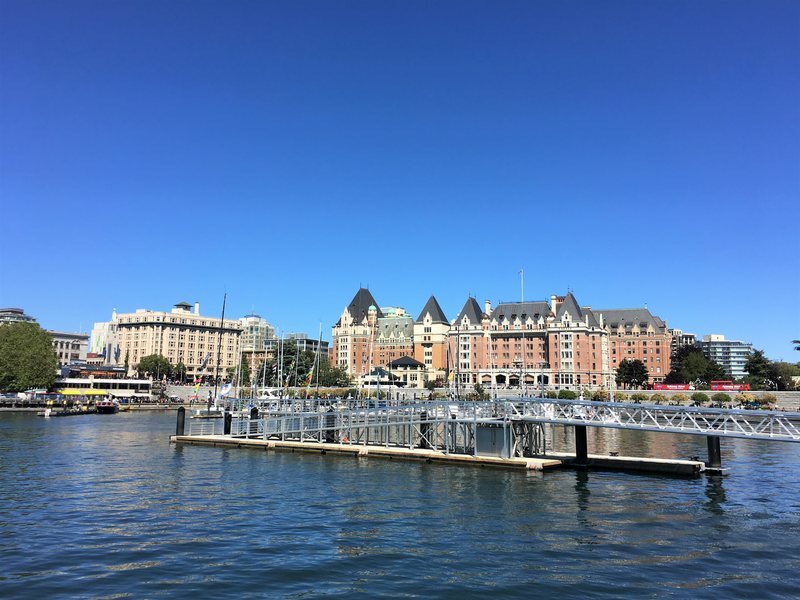 The weather was so great during our visit to Victoria, we spent all of our time outside and didn’t get around to do the famous Tea at the Empress. Next time we definitely will, I’ve hear it’s quite the experience! Victoria has a lovely historic center which can easily be navigated on foot. Pick up a map at the Visitor Center and spend the day wandering from one beautiful building to the next. 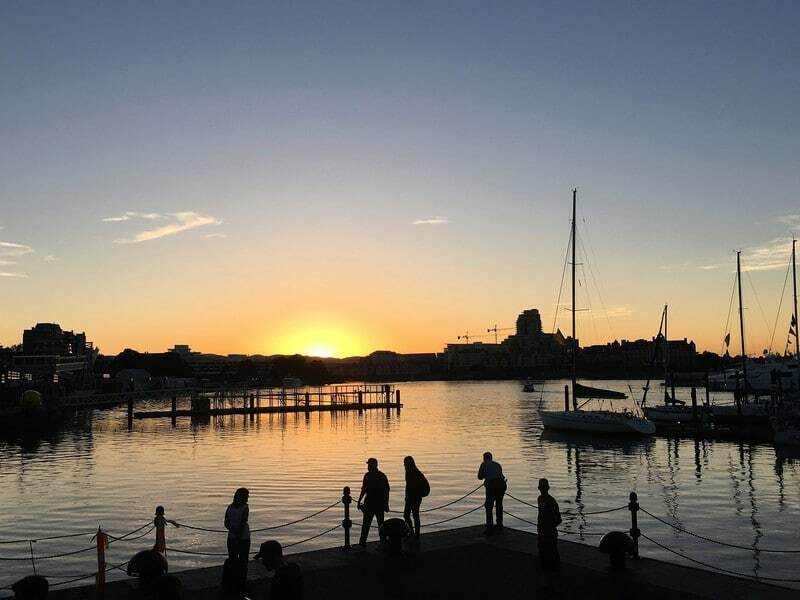 Another Victoria hotspot is quirky Fisherman’s Wharf, a floating village with colorful houses and cute little shops. 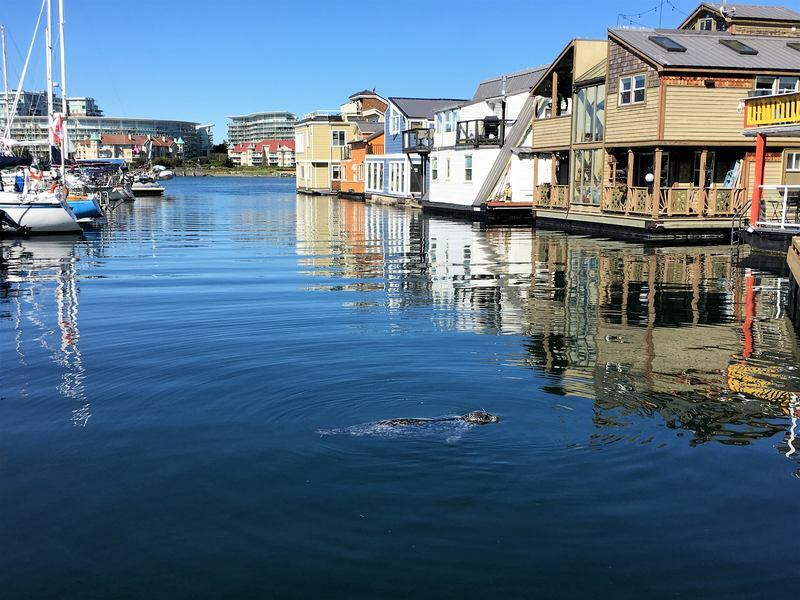 Don’t be surprised to see some other inhabitants of the wharf floating in the bay (yup, that’s a seal!). Victoria is a green city and surrounded by ocean. 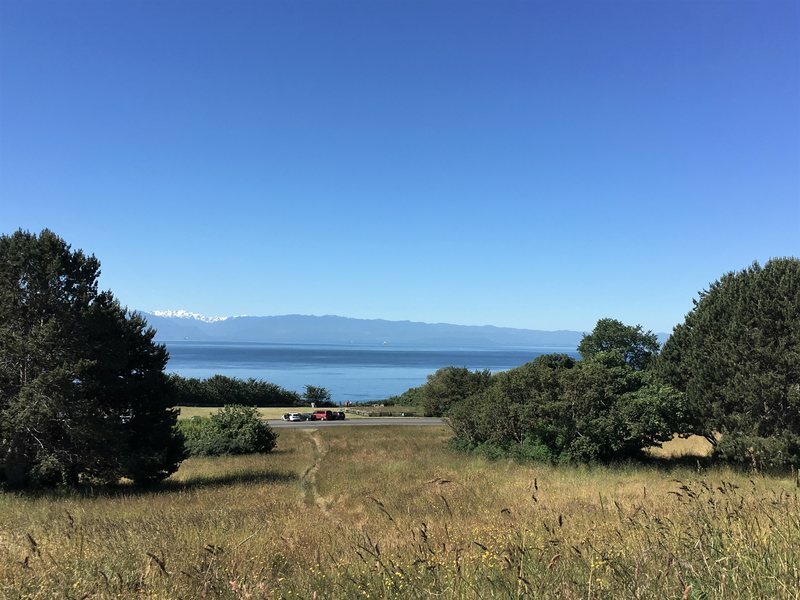 From Beacon Hill Park you have a great view over the Strait of Juan de Fuca. 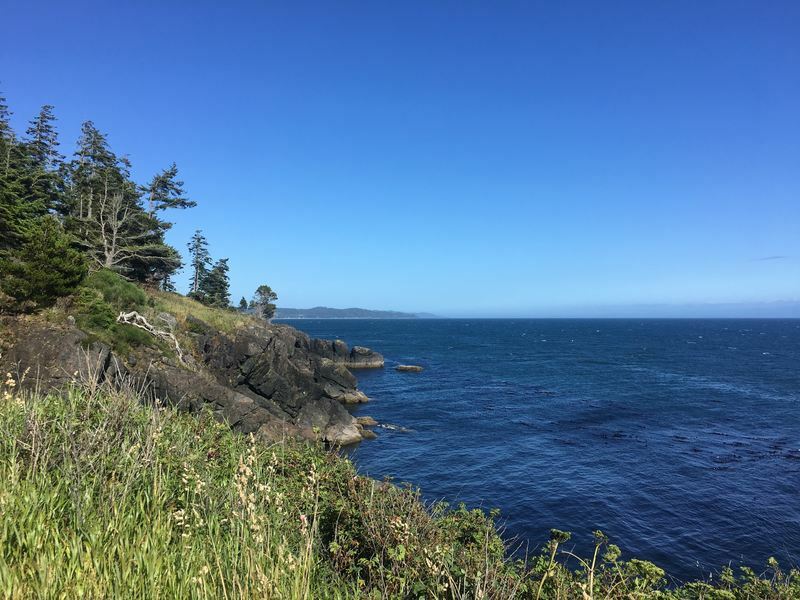 On a clear day you can easily see the U.S.A. on the other side of the strait. 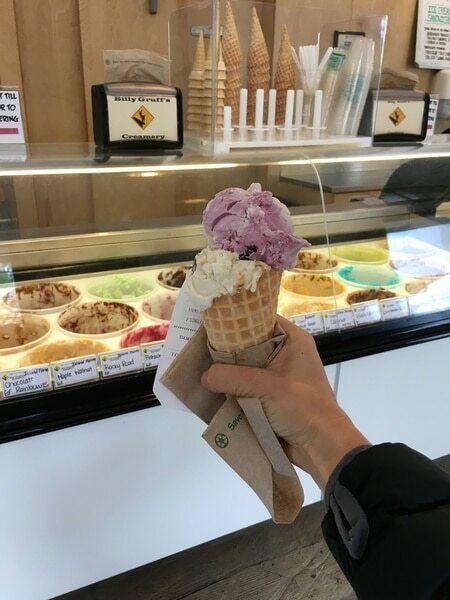 All that walking around Victoria makes you hungry and a great spot to replenish your energy is Crust Bakery. 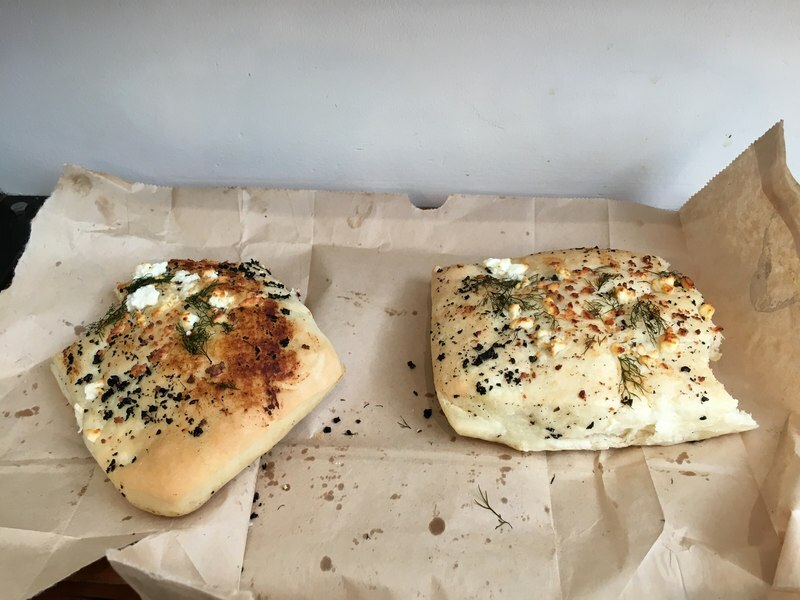 I particularly liked their soft and fragrant focaccia! 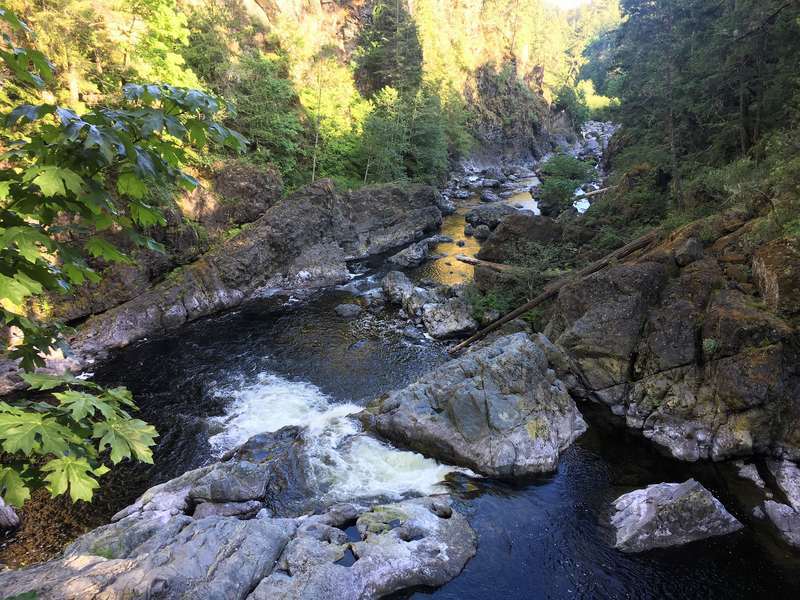 Canada has countless Provincial and National Parks and one of those is Sooke Potholes Provincial Park. The name says it all, you can see potholes in this park. 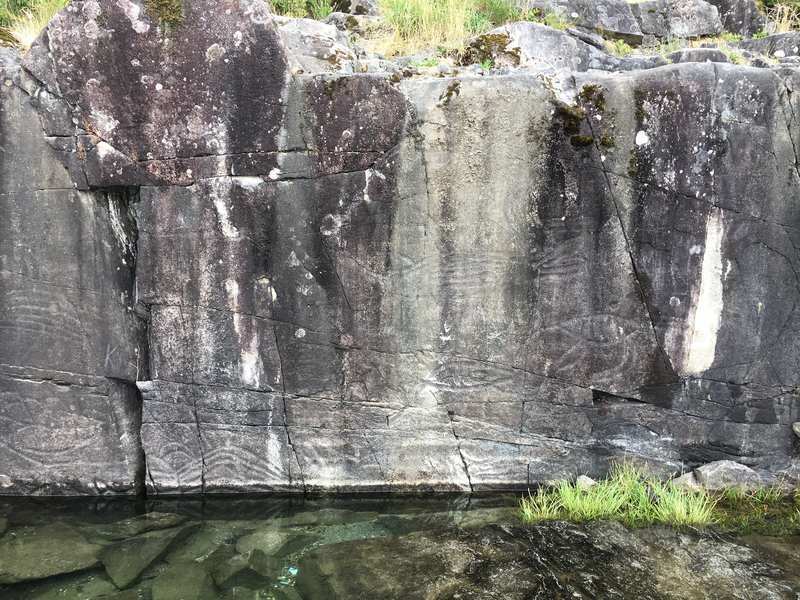 But not those annoying potholes on ill-maintained roads… No, huge potholes created by massive boulders being carried downstream by the thundering river when the glaciers melted a long time ago. Nowadays the river is much calmer and you can even go for a swim in designated areas! It’s just a short loop (less than 3 kilometers) but very worthwhile. The trail leads through the forest and over the rugged beach with rocky pools. However, the reason this was an epic trail for us is because we say our first bear! 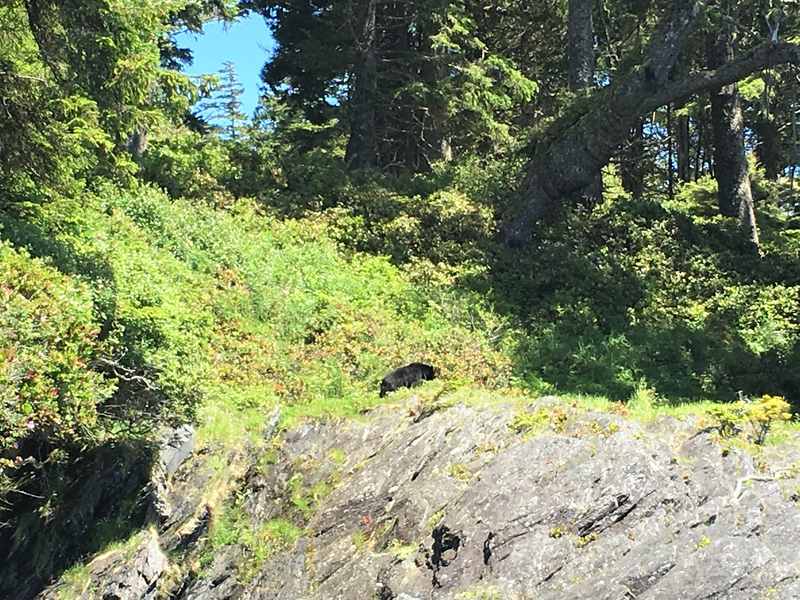 A young, and therefore relatively small one, black bear walking around on the beach… It’s so cool to see wild animals in their natural habitat, obviously we kept an appropriate distance. Apologies for the abysmal quality of the picture, not being able to take proper wildlife pictures is what convinced me to finally buy an actual grown-up camera. 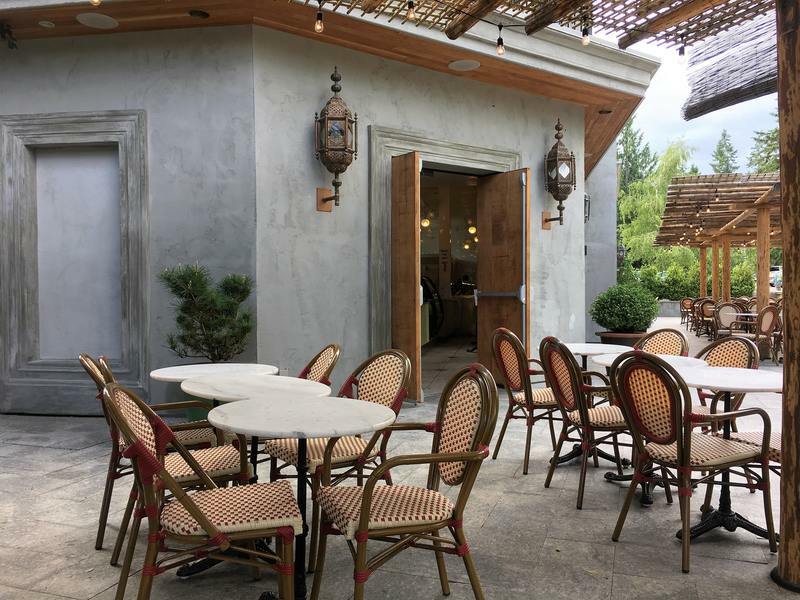 If you are looking for an off-the-beaten path place to visit, this is it! 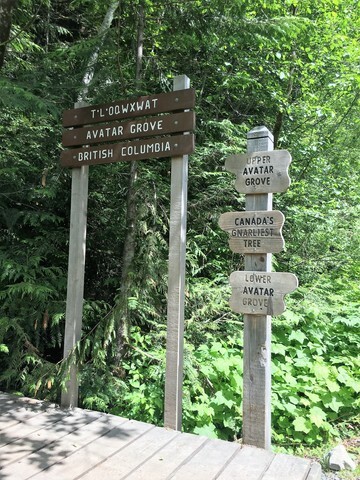 The road leading to Avatar Grove is rather bumpy, we drove very slow and walked the last kilometer to the trail-head. 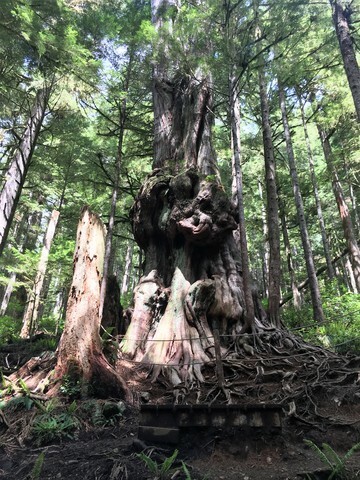 But it’s pretty fun to see the the Gnarliest Tree in Canada, it looks like a giant tied a knot in it! A lovely little lake surrounded by trees and mountains, the perfect place for a pick-nick. Keep an eye out for otters and other wildlife! 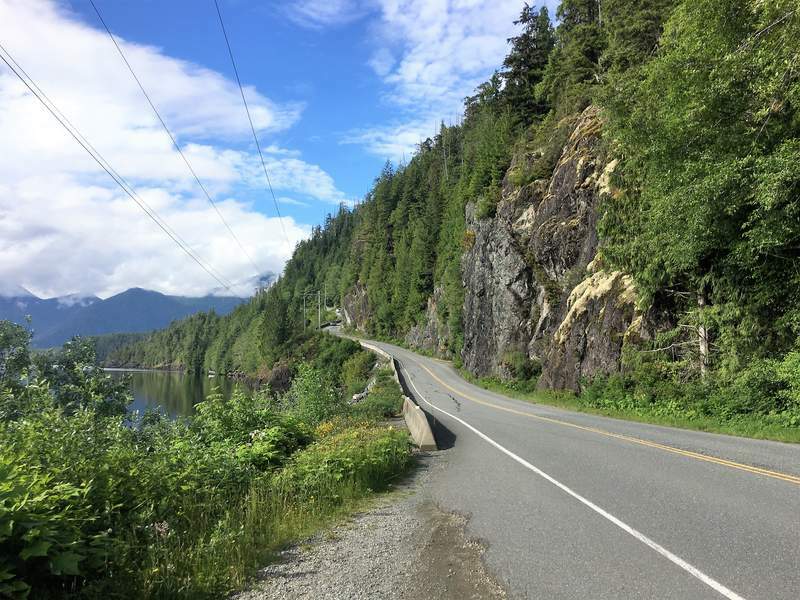 The road between Port Renfrew and Honeymoon Bay is very quiet and very beautiful. My advice: wake up early, pack enough water, food and fuel for the road (there are no amenities along the road) and enjoy the ride! Jakes at the Lake is the perfect pub in the perfect location… We had a tasty dinner on the patio while watching the sun set over the lake. I’ll be honest: this isn’t the most impressive waterfall you’ll find in Canada. 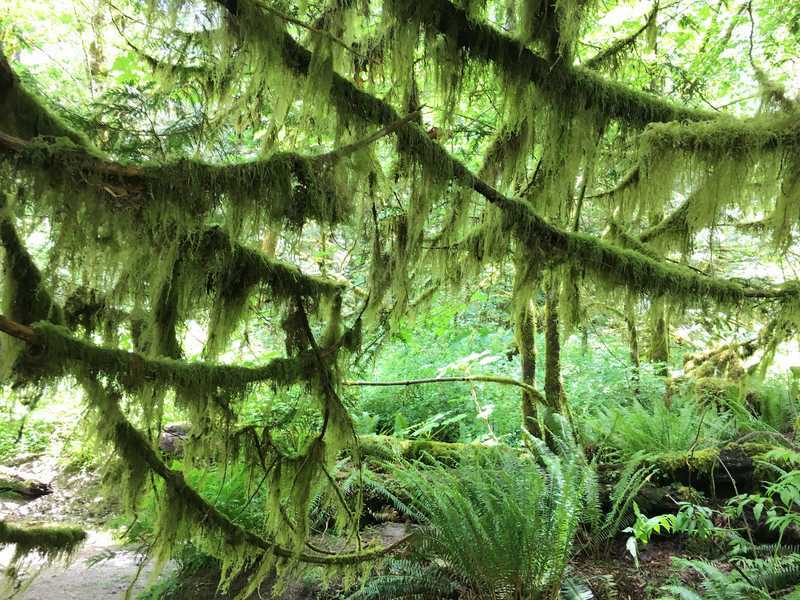 Nevertheless, it’s a lovely walk through the forest and a good place to stretch your legs when driving from Lake Cowichan to Nanaimo (or vice versa). 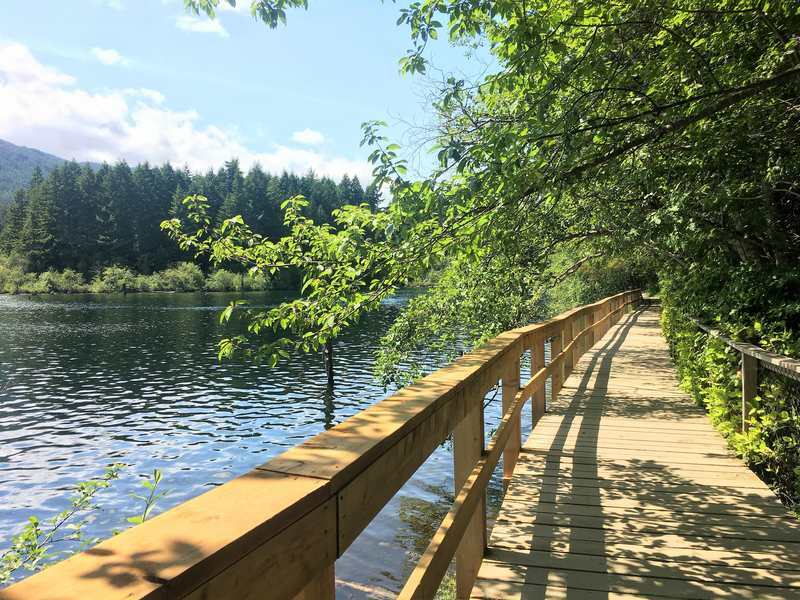 This easy 5,5km trail goes around Westwood Lake and makes for a perfect afternoon stroll. When we visited the weather couldn’t have been more perfect and the park was filled with families celebrating summer. 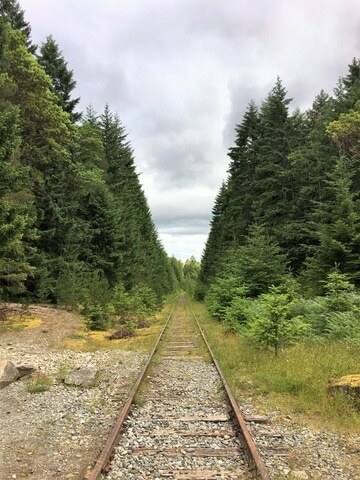 Even if the weather isn’t that great, this 1 kilometer trail (return) to the Abyss is a nice short stroll. 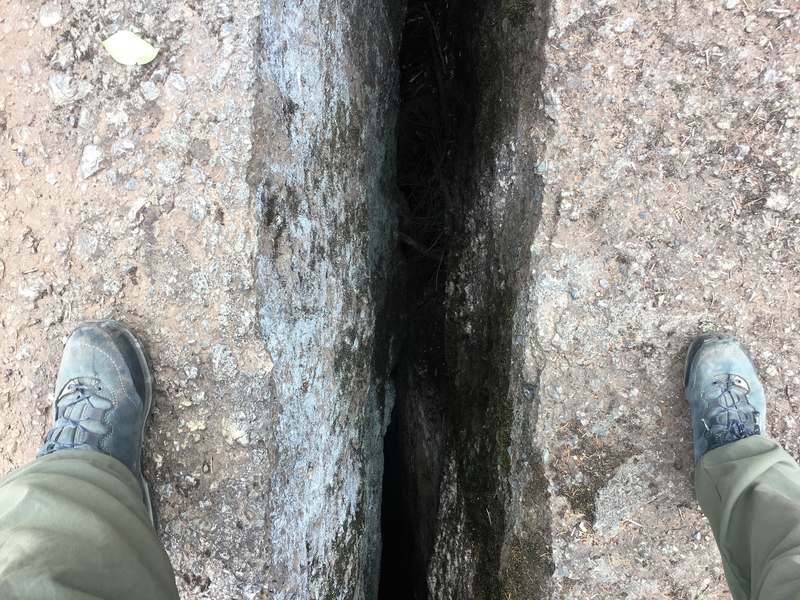 Once you are atop the rocks you’ll see the jagged crack in the ground, aka the Abyss. It’s deep, so be careful! 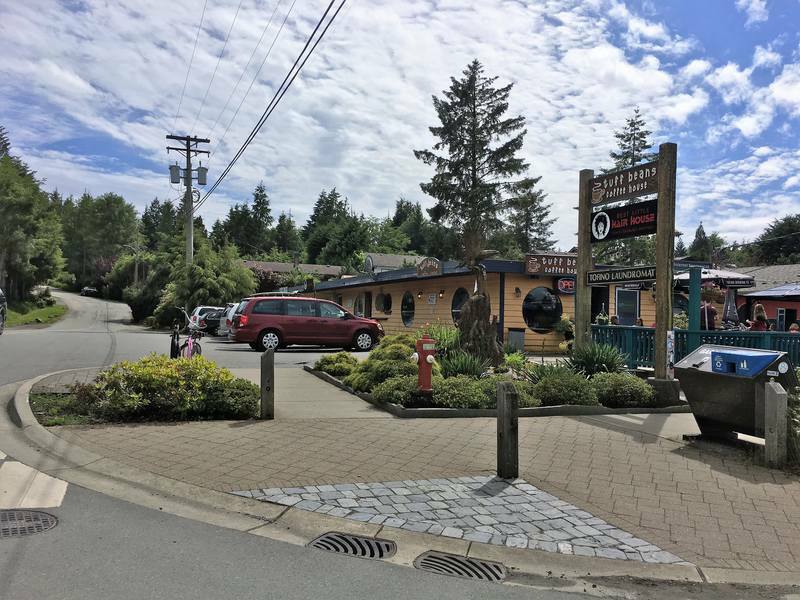 Nanaimo Old Town has cute colorful houses, lovely cafes and beautiful boutique shops. Read more about the area here. 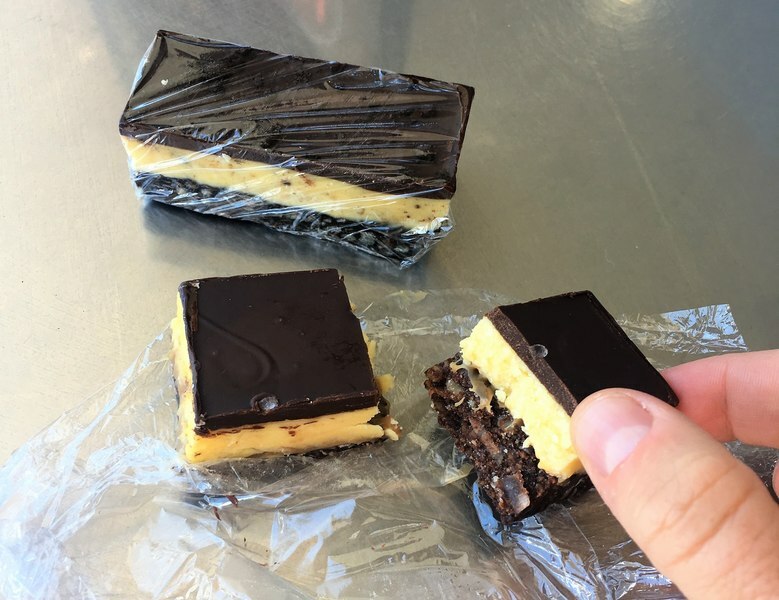 Don’t forget to sample some Nanaimo bars! 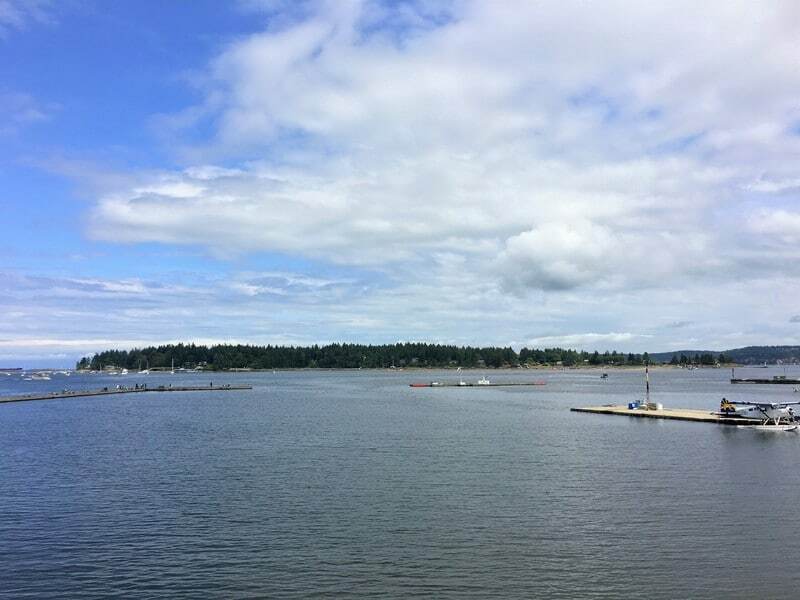 Nanaimo has a very nice harbor front with beautiful views over Newcastle Island and Protection Island. 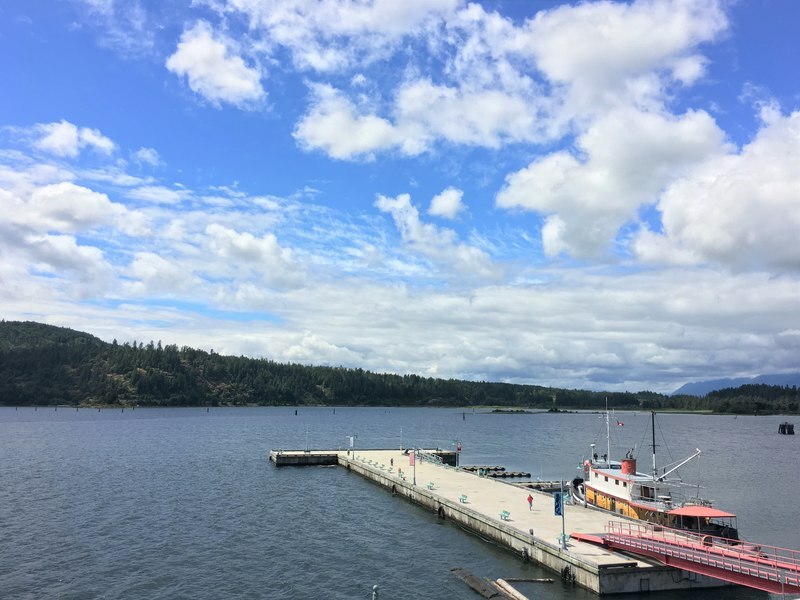 At Nanaimo Harbor you can also catch a small ferry (only for pedestrians) to the Dinghy Dock Pub, the only floating pub in Canada! 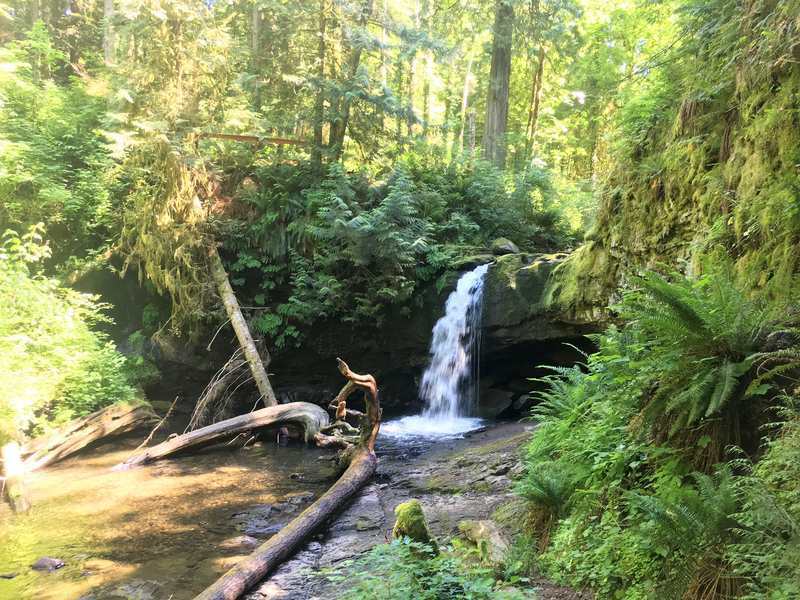 This is an easy 5km (return) hike, walking to the Ammonite Falls and back took us a little over an hour. The falls are beautiful, but because most of the snow had already melted when we visited in June they were not as spectacular as in early Spring. Sometimes it rains in Canada and on those days the best place to be is a pub like this one. We received a warm welcome from the staff and spend the rainy afternoon sampling beer and cider. When the rain continues, don’t despair! 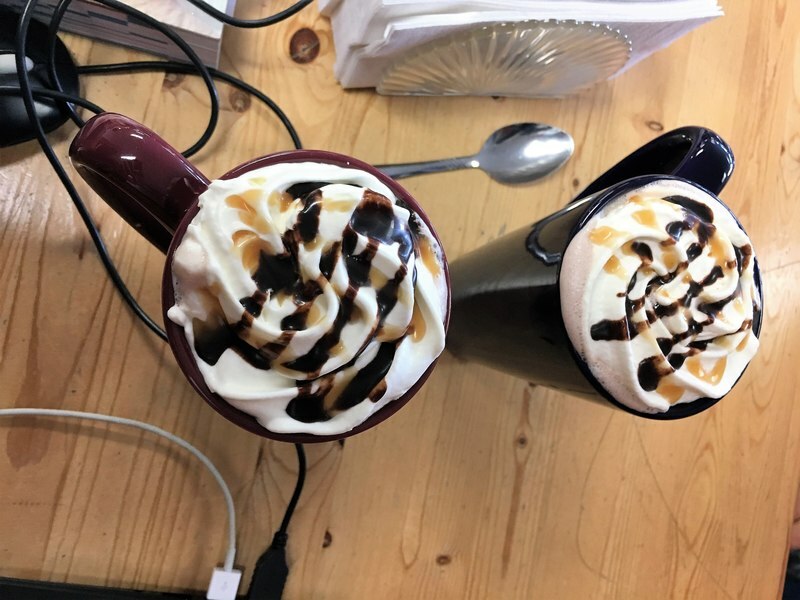 The Qualicum Foods Cafe serves hot coffee and delicious sandwiches. There is WiFi and sockets to charge your devices. What more could you wish for? Besides a blue sky that is;-). 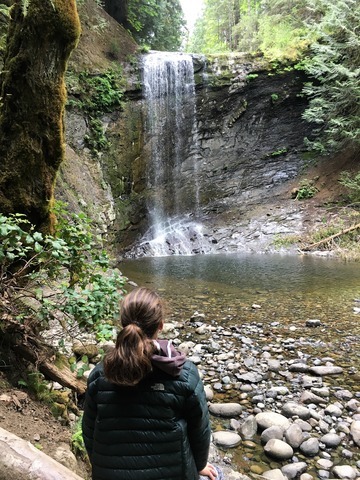 The upside of rainy days is all that rain makes for thundering waterfalls and the Englishman River Falls definitely falls (no pun intended;-) into that category. 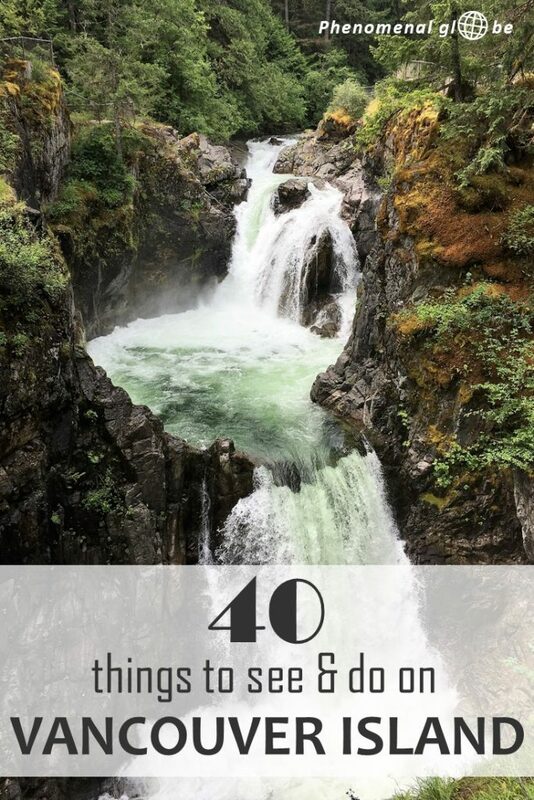 It’s only a short and easy walk to these pretty falls, don’t miss them on your Vancouver Island trip! 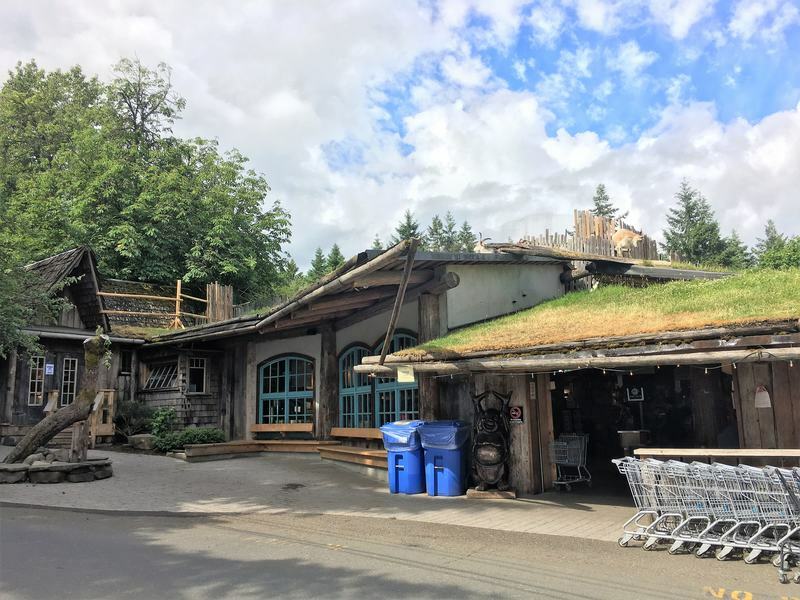 The Old Country Market in Coombs is famous for the grazing goats on the roof of the market, but there is much more to see! There are cute shops and the market has a great selection of fresh products (like delicious smelling rosemary bread) and imported international products (like real Italian espresso for coffee-addicts like myself). 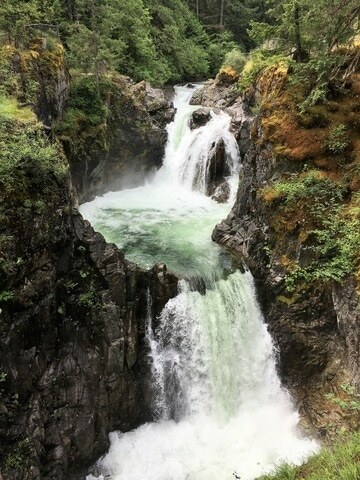 I visited several waterfall on Vancouver Island, but the ‘Little’ Qualicum Falls were the most impressive. 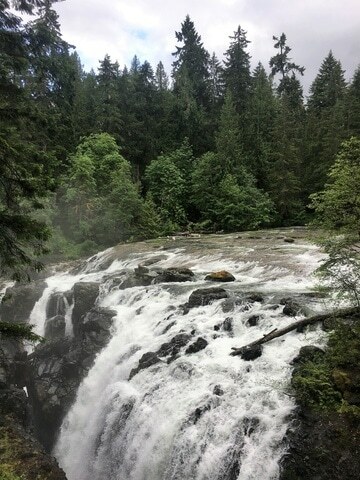 Cascading down several tiers these roaring falls took my breath away, nature is so powerful! 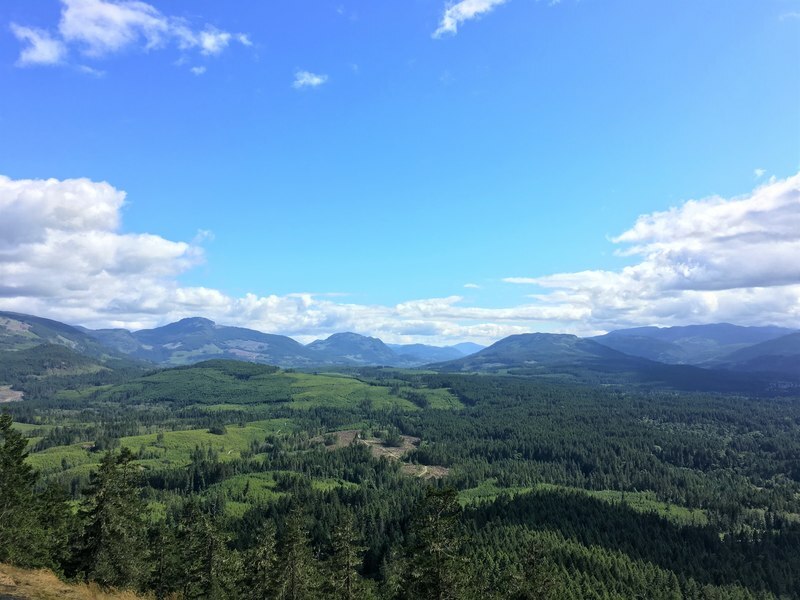 It’s a bit of a climb (300 meters elevation, 9 km return), but the view over the Port Alberni valley is splendid! I completely understand why they built a fire lookout in this particular spot, you can see for miles and miles in all directions! Port Alberni isn’t very big but the harbor front is rather cute. The view over the Alberni Inlet (with its 40km the longest inlet on Vancouver Island) is beautiful. 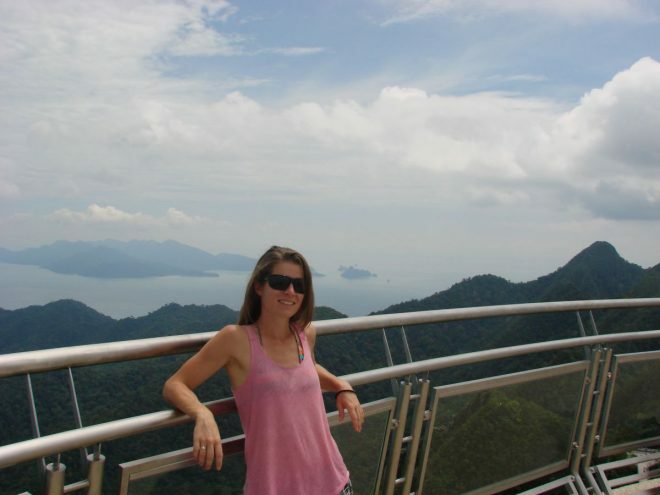 At the harbor front you can climb a small lookout tower, there are several nice shops and the All Mex’D Up Taco Shop. I had never seen salmon (alive;-) before, let alone seen them migrate up a river! 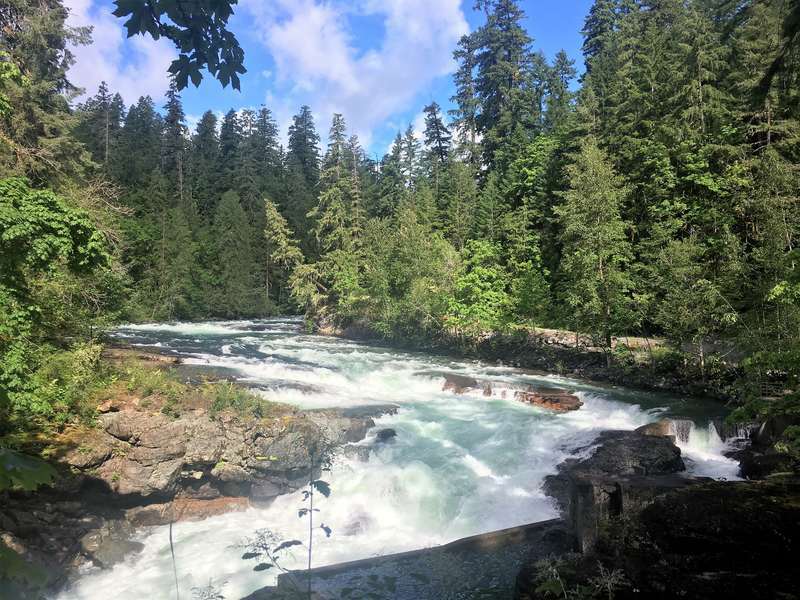 At the Stamp river falls a fish ladder has been installed, helping the salmon in their journey upstream. 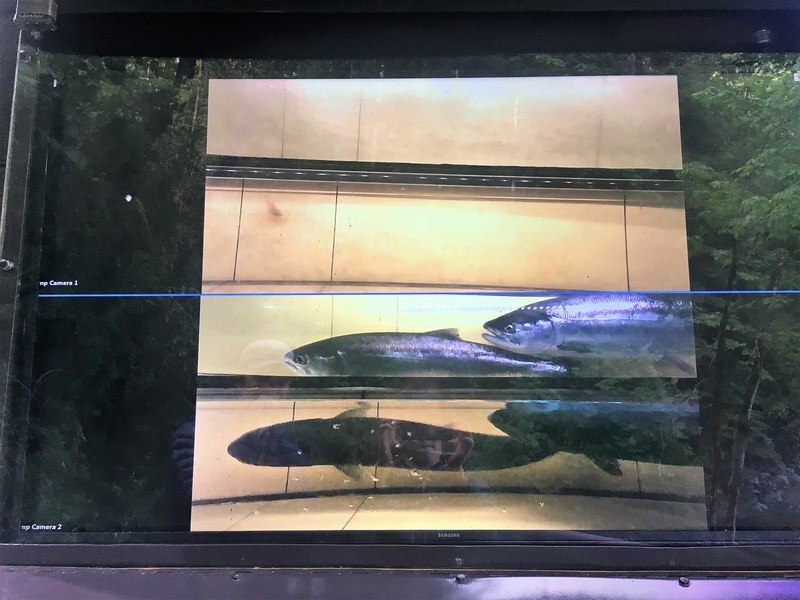 The fun part: here is a big TV showing a life stream from the fish ladder. So you can actually see the salmon swimming through! 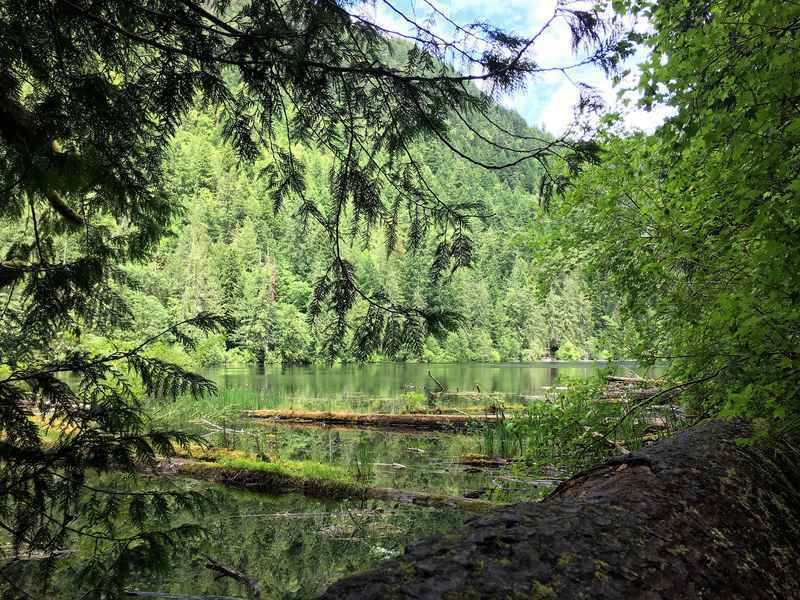 A short trail leads along the lake to K’ak’awin, one of the best preserved petroglyphs in British Columbia. What do you think it looks like? 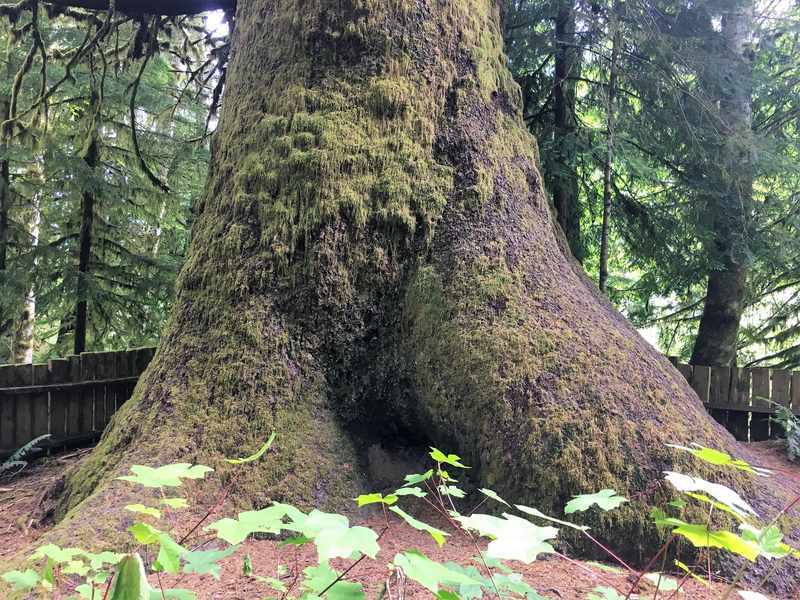 The Monster of Sprout Lake? 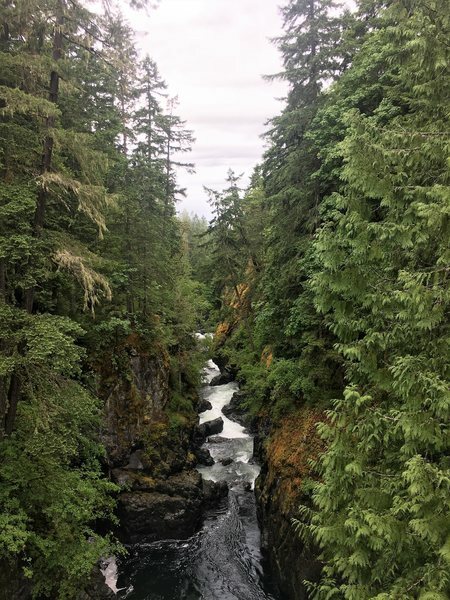 The road to Ucluelet and Tofino is beautiful, leading along lakes and through green forests, bringing you slowly to the wild South coast of Vancouver Island. Take your time and stop often to take pictures! 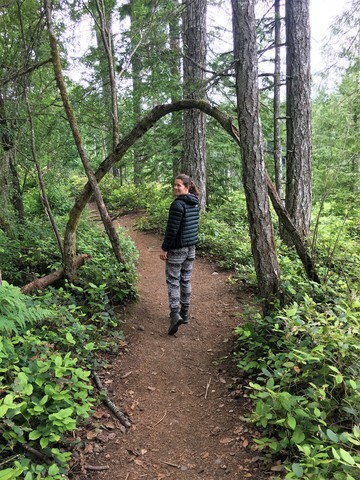 We hiked these trails in the rain, but even so, the views were hauntingly beautiful… What an amazing and rugged coastline! You can find detailed information about the hike (including a map) on this website. Be aware bears and wolfs are often seen on the trail, so read up on what to do when you encounter one. 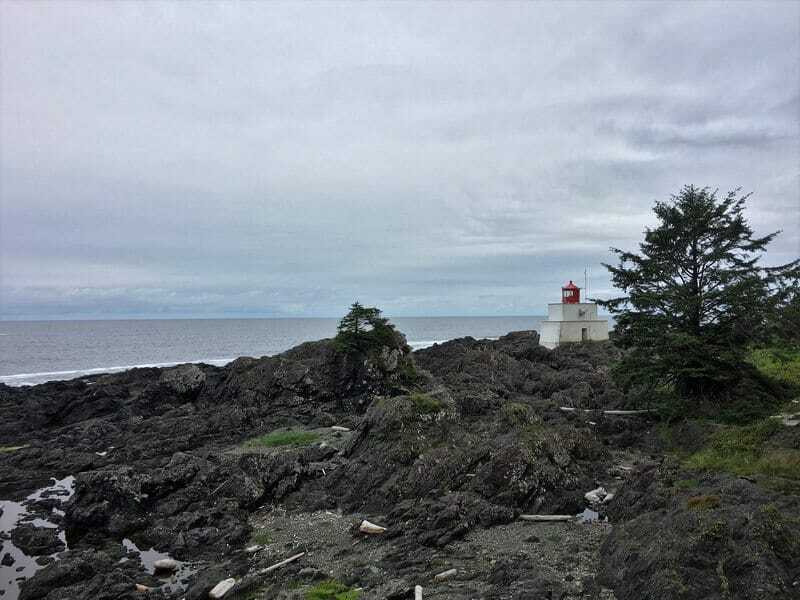 The Amphitrite Point Lighthouse may not be very pretty, but it is very strong! 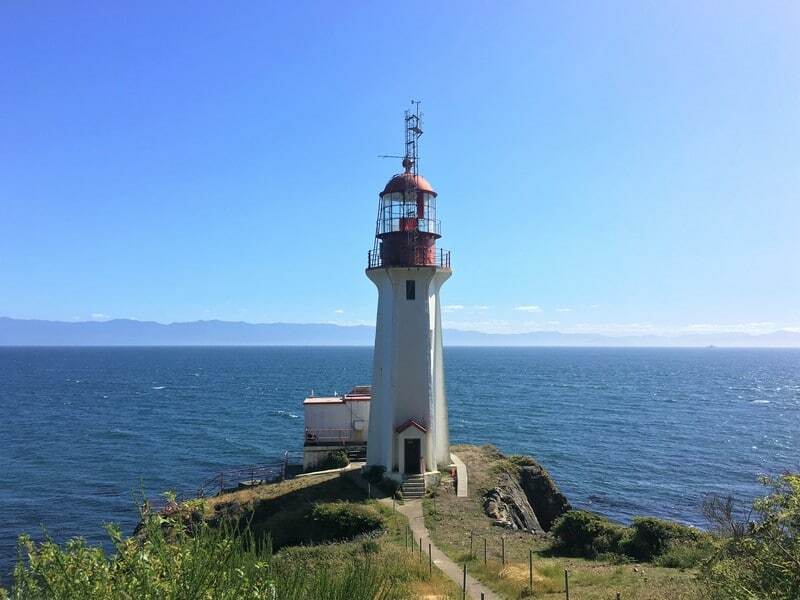 Interesting fact: being the Lighthouse keeper wasn’t an easy job back in the days… The first keeper lived a mile from the lighthouse, he hiked down every night at sunset to light the lamp. The keeper would return at midnight to rewind the mechanism and again at sunrise to extinguish the lamp. So much for a good night sleep! But a good thing he did, before the lighthouse was built many ships sank in this treacherous part of the Pacific Ocean. A short and easy hike (4km return), but a beautiful one nonetheless. Leading to Schooner Beach via a boardwalk through green rainforest, what’s not to like! I am not exaggerating when I say that every Canadian we spoke to asked if we would be visiting Tofino. Apparently Tofino is pretty famous in Canada! And while I’ll admit it’s hipster galore, Tofino is a nice place to visit. It’s a cute town with bakeries, cafes, shops and galleries, perfect to be explored on foot on a sunny afternoon. 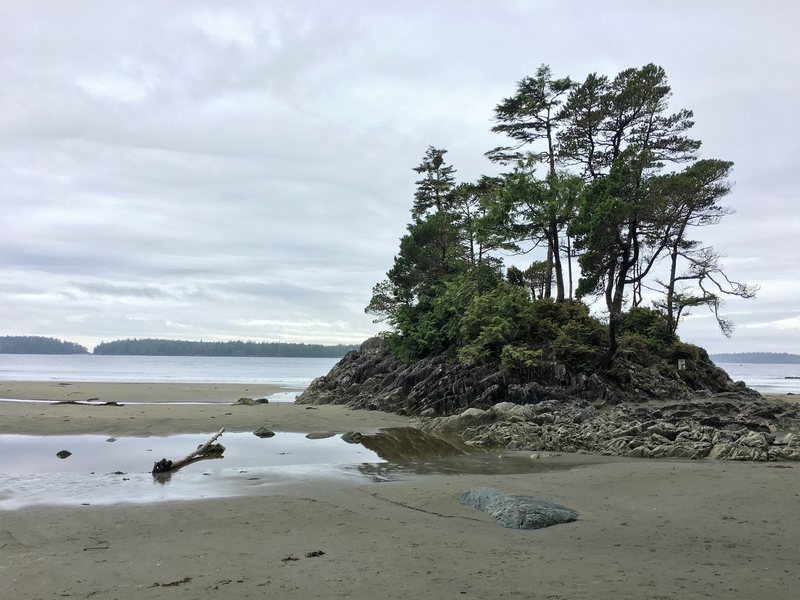 Yet another nice little hike on Vancouver Island… The Tonquin trail is an easy 3km loop through the rainforest and leads to Tonquin Beach. We visited during the day, but Tonquin Beach is also a very popular place to watch the sunset. 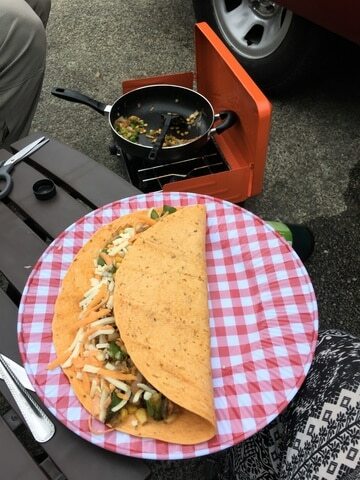 I’ve shared most of my favorite places to eat on Vancouver Island with you already (see the list of highlights above) but truth be told, most of the days we cooked our own food! 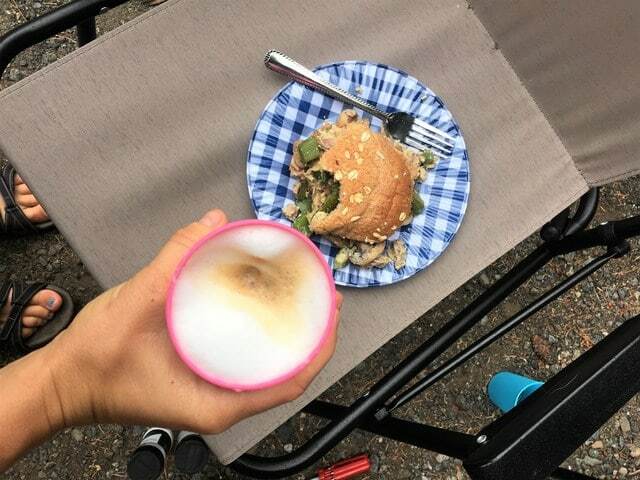 Eating out is great, but costs add up quickly… A much more economical way to travel around Vancouver Island (and Canada as a whole) is by cooking your own breakfast, lunch and dinner. 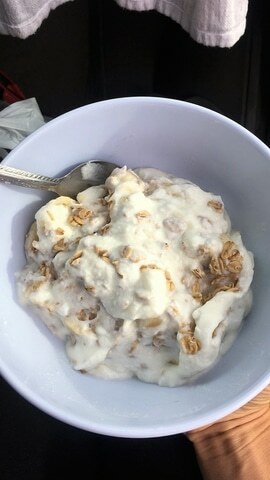 You can find a Walmart in the bigger cities (Victoria, Nanaimo and Port Alberni) and smaller (slightly more expensive) local supermarkets in villages (Ucluelet, Tofino and Qualicum Beach) where you can buy all necessary ingredients to cook yourself a delicious, nutritious and healthy meal. 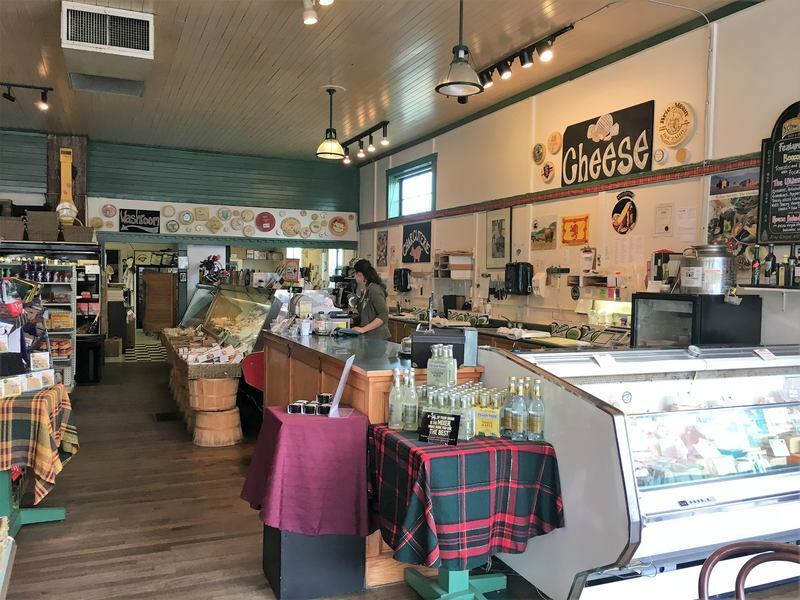 Now that I’ve covered the highlights and best places to eat on Vancouver Island, you’re probably wondering where to stay. 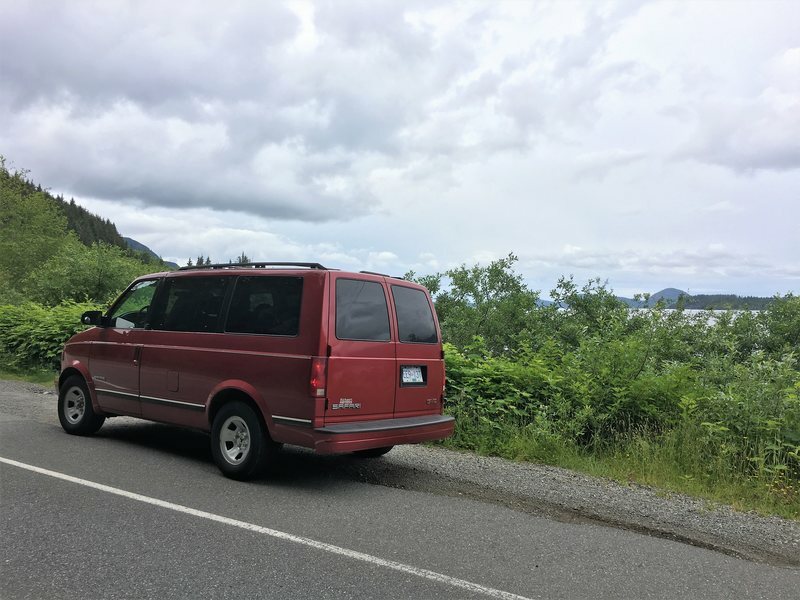 As mentioned at the start of the post, we bought a red GMC Safari van and slept in our car most of the time. In general it’s not difficult to find a place to park for the night, but sometimes you’ll see a sign saying ‘No overnight parking or camping’, obviously you shouldn’t stay there;-). 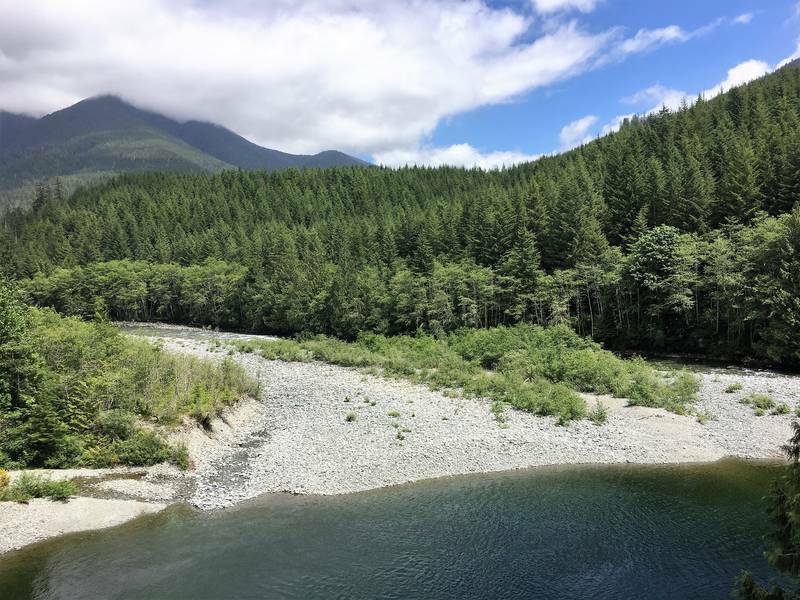 We found most spots using the iOverlander app, it’s free and you can find comments of people who have (recently) visited a particular camping spot. Below (and on the printable map) you can find the details of the (free) campsites we stayed at on Vancouver Island. It can be challenging to find overnight parking in Victoria (there are lots of no camping/overnight parking signs). But we read about the Clipper Ferry parking lot on the iOverlander app and there is no sign explicitly saying no camping. 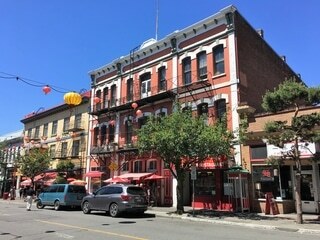 We paid 18 CAD for 24 hour parking, which enabled us to explore Victoria on foot, park our car in a safe place and sleep in the city center! As long as it’s allowed, I definitely recommend this place! The only night on Vancouver Island we didn’t sleep in our cozy van was when we stayed at this Airbnb room. Because sometimes you need to do laundry, take a shower, charge your electronics and refill your water jug. We had a great stay here, the bed was super comfortable, the bathroom clean and the entire house is beautifully decorated. The neighborhood is very friendly and quiet. It’s a 20 minute drive to Victoria city center. The price per night is $38 (US dollar). Another upside about having dinner at Jakes at the Lake: we could roll straight from the patio into our bed as we parked our van at the parking lot behind the pub. Obviously we first asked the staff if that was okay and they didn’t mind at all. A bit out of Nanaimo Town and very quiet. We stayed here 2 nights in a row and in the morning we were greeted cheerfully by the locals walking their dogs. 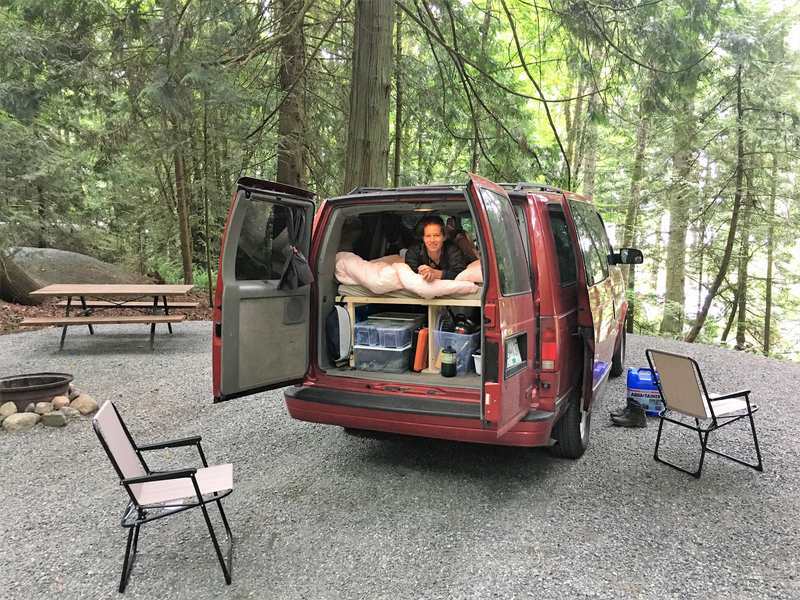 A very nice campsite in the forest, close to Nanaimo. Our shady forest camp spot had a fire pit and pick-nick table. Clean toilets and good showers (1 CAD for 5 minutes), coin laundry (2,50 CAD) and dryer (1 CAD) on the campsite and a nice common room with WiFi and sockets for charging stuff. 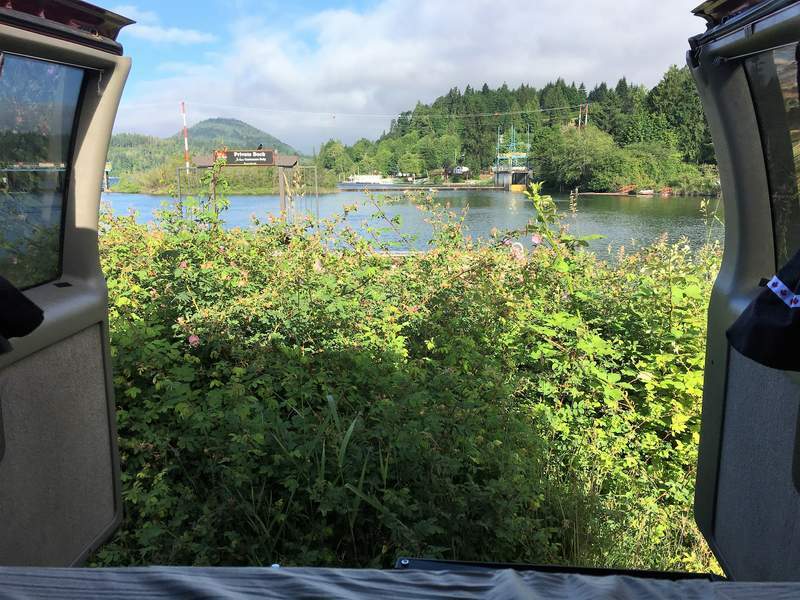 We paid 28,35 CAD for a camp spot (without water/electricity, low season price). 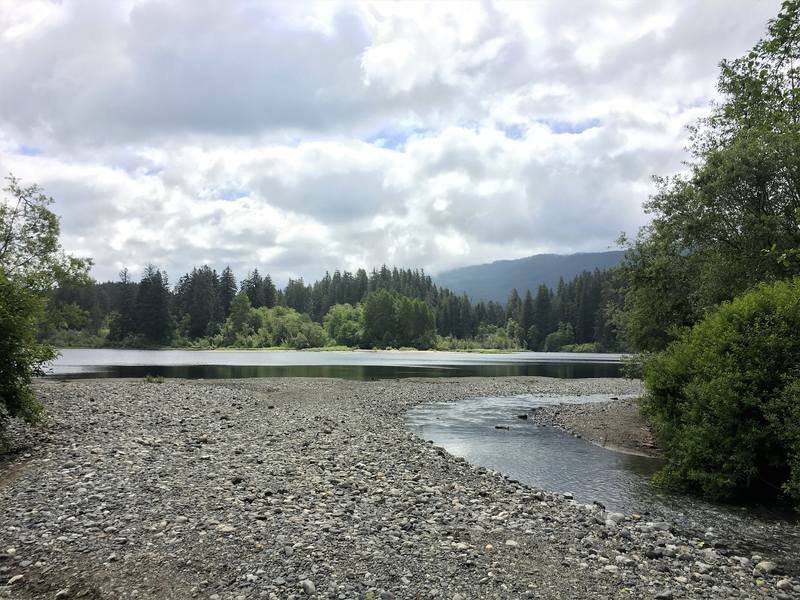 We found a small dirt road on our way back from the Englishman River Falls and parked there for the night. We slept perfectly fine, but in the morning two passing locals told us the road is also used by drug dealers and prostitutes… Probably not the best place to park in hindsight. Again, we asked the pub staff if we could stay here and paid 5 Canadian dollars for a night. The upside of staying at a pub’s parking lot is that you can brush your teeth in the restroom instead and don’t have to pee, ahem, outside;-). We found this place on the iOverlander app and stayed here twice (both on our way down to Ucluelet and Tofino and on our way back up). Nobody bothered us and we bothered nobody. You can even take a shower (4 dollar if I remember correct) at the Recreation Center next to the library. If at any time in the future overnight parking is no longer allowed at this spot, there is also a Walmart in Port Alberni where you can stay. For us the only reason to stay at an official campground is when we need a shower, need to do laundry or a combination of these. Which was the case in Ucluelet. 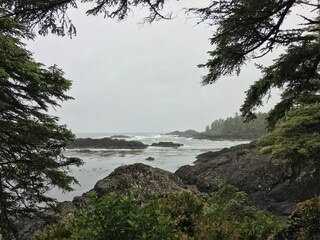 One of the most expensive campgrounds we stayed at in Canada, but Ucluelet is very touristy so that was to be expected. 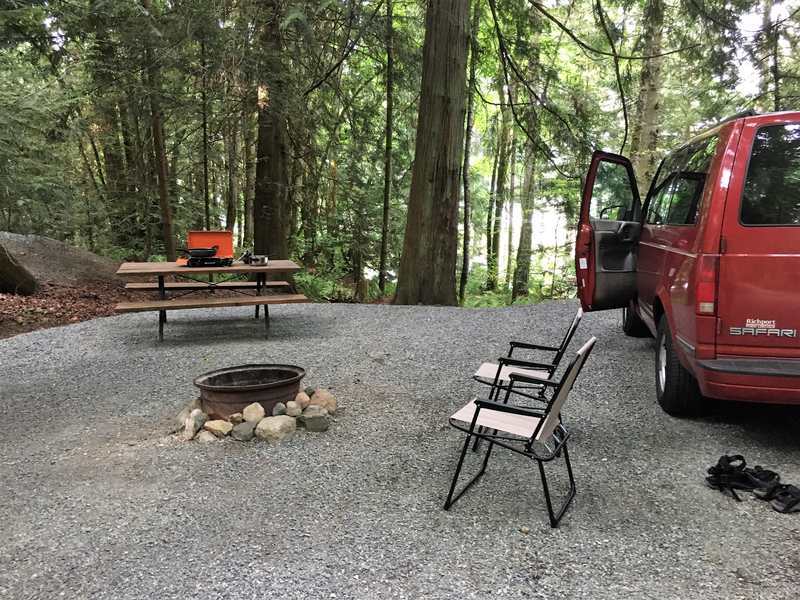 We didn’t feel like paying another 40 CAD for a night at Ucluelet Campground (after all, we already showered and did laundry). So we asked the friendly owner of the Matterson House if we could park at the back of the restaurant, which was no problem at all! 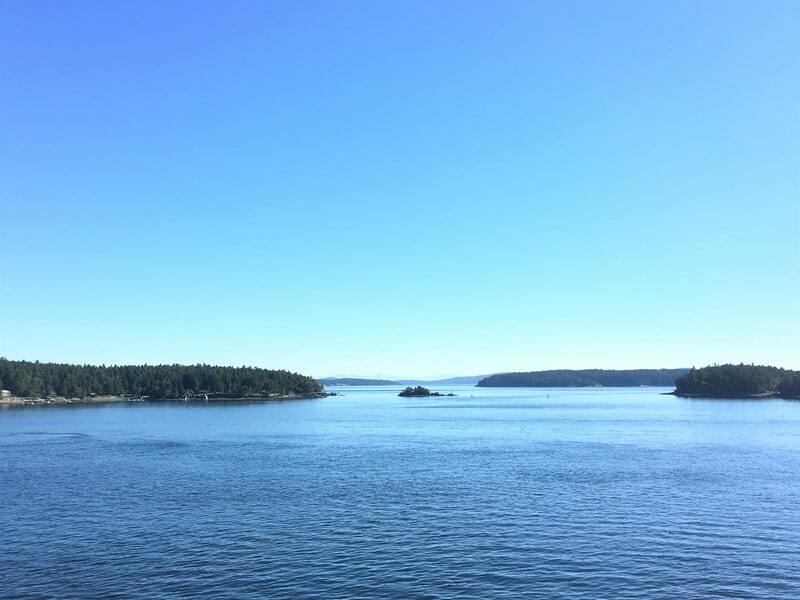 The only way to get to Vancouver Island with your car is by ferry. You can find the schedule and information about prices here. 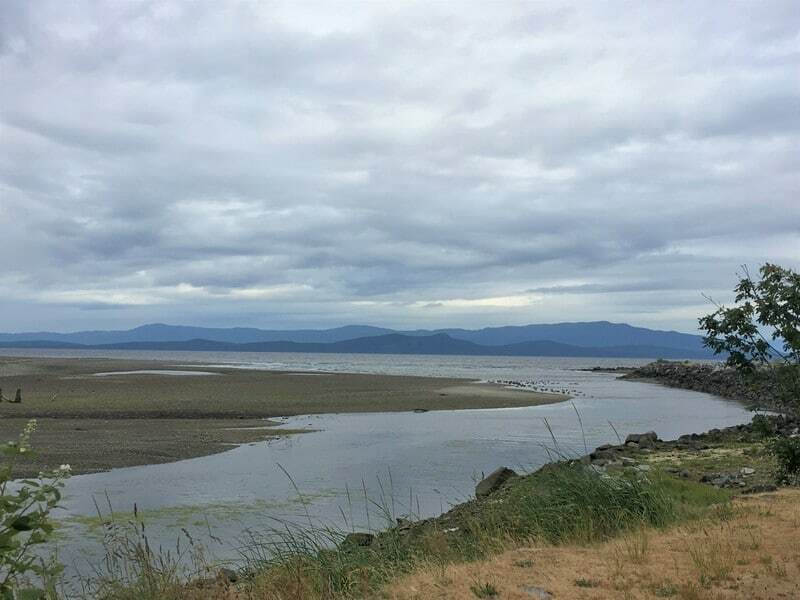 We took the boat from Tsawwassen to Swartz Bay and returned from Duke Point to Tsawwassen. However, another great option is to take the ferry from Departure Bay to Horseshoe Bay if you plan to go to Whistler next. Horseshoe Bay is located north of Vancouver, meaning you’ll avoid driving through the busy center. 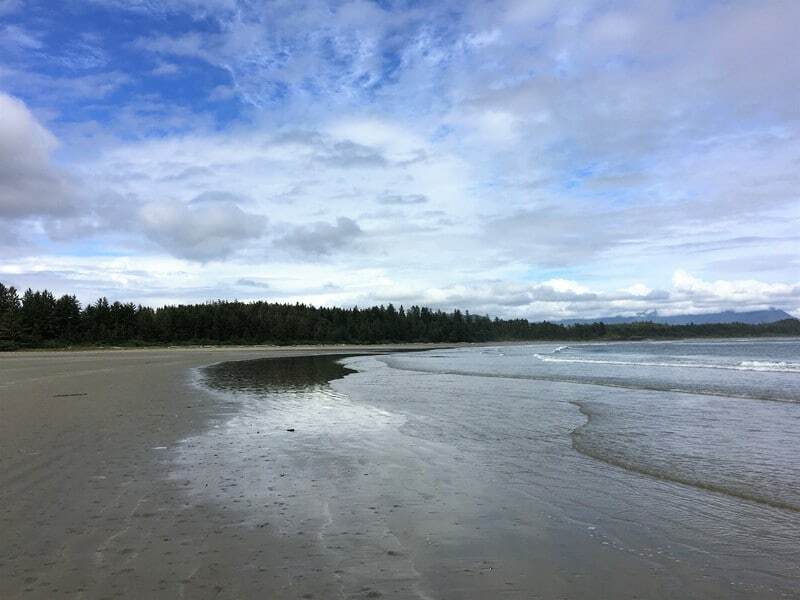 Or, if you have lots of time, you could take a ferry from Comox to Powell River and explore the quiet Sunshine Coast. The total ferry price depends on the length and height of your vehicle, we paid 89,70 CAD both ways (price for an ‘undersized vehicle’ and 2 adults). 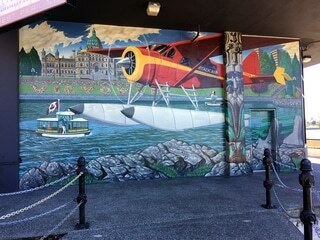 You can also fly to Victoria, there is an international airport in North Saanich (about 20km from the Victoria). There is public transport on Vancouver Island, but it’s not an extensive network. You can find more information here. 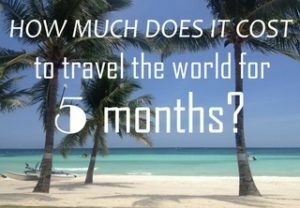 Personally, I feel Canada is a roadtrip country and recommend either buying a car (if you are planning to stay longer than 6 weeks) or renting a car (if you are on a shorter trip). Having your own wheels gives you endless freedom to stop wherever you want! Also, most hiking trails don’t start in the middle of a village so it can be challenging to get there without your own transportation. As promised, you can download a pdf with all the places mentioned in the post below. There is an overview map of the island and 3 detailed maps for Victoria, Nanaimo and the area between Qualicum and Port Alberni. I hope you enjoyed this post! Feel free to ask any questions you have by leaving a comment or sending me an email. Oh my goood, you bought a new camera! I SO want to learn everything! Do you like it? Is it cool to use? Is it heavy? Would you still use it in shady parts of town, or does it screams “tourist!”? I still haven’t bought mine yet 🙂 ! How have you been? Yes I finally took the plunge, it took me long enough;-). I really like it, yesterday I photographed whales swimming of the coast, something I’ve dreamed of for years and wouldn’t have been able to do without a proper camera and telephoto lens (70-300). The camera itself isn’t that heavy but together with the camera bag, 2 lenses and a small tripod it weights about 2kg I think. Still not bad for a DSLR. So far I have used it mostly in nature and some parts of San Francisco but I carried it in my backpack instead of my camera bag (screams tourist indeed;-). Which brand are you currently leaning to? I spent a couple evenings doing research and both the Nikon D3300 as well as the Canon D70/80 did well in most reviews I read. The Canon is more expensive though and I felt for a first DSLR the Nikon would be more than sufficient to keep me occupied;-). Enjoy your day! Fantastic! Vancouver island looks so different to the city – it looks like they get some great sunsets and have stunning nature. I would love to rent a van like you guys to travel around in – I rented a car in Miami but as it was a convertible it wasn’t the most practical to sleep in! Absolutely Mark, if you have the change I would definitely recommend a road trip around Vancouver Island! But probably better if you get a car that’s not a convertible, it can get pretty cold there;-).